My friend Murray asked for help with one of his ancestral lines last Sunday. I found the christening record for Anna Gajdzica who I knew to be one of the children of Jan Gajdzica and Eva Mojnar. The godparents were Adam Wojnar and Anna Stachura. This seemed like a very promising lead since godparents are typically close family members or lifetime friends. They are Jan Wojnar born about 1850 G9NY-T4K and Maryja Kapustka born about 1850 LBFB-VPW These families were from Poland and settled at Yorkton, Saskatchewan about 1900. The 1921 Canada census lists Adam Wojnar's children as. So this adds 10 people to Murray's family tree. My cousin Darlene sent me a recent obituary for Mary May McCracken Buchanan, the wife of my 3rd cousin Mervyn Buchanan. It brought back fond memories. I remember when I first met Merv and Mary. I was 20 years old. It was in September 1962, that I hitch-hiked from Calgary to Neepawa, Manitoba, looking for information on Dad's ancestors. I was in the Neepawa Banner office looking for family obituaries. A staff member told me that I should talk to Mervyn Buchanan, who was the manager of the salt plant, and who was very interested in Buchanan genealogy. So I walked to Merv's house and introduced myself. I was invited by Merv and Mary to stay with them and accept their help in my quest. For the next few days I would interview elderly relatives in town during the daytime, and after supper Merv would drive me to visit out-of-town relatives. My notepad and my package of Family Group Records became full of family information, and I hitch-hiked back to Calgary with more genealogy information than I had dreamed of. In 1997 was the next time I was in Neepawa. I visited Mervyn and received a photocopy of the Watson material that had been sent to him by Marguerite MacDonald of Sarnia, Ontario. I was also able to copy his large pictures of his great grandparents Samuel Buchanan and Mary Watson. (These were also the brother of my great grandfather John Buchanan and the sister of my great grandmother Isabella Watson, as Merv and I were double cousins. My father was William George Buchanan, who was the son of William Andrew, who was the son of John and Isabella.). In 2003 we visited Merv in Neepawa and shared some family history information, but he was experiencing some health issues at that time. Merv passed away there in 2013, and Mary in 2019. They were kind and generous people who had a positive impact on my life. After I graduated from U of C with my education degree, my work took me to Brooks, then Grande Cache, then Edmonton, and then Barrhead. In 1977 something interesting happened. A work assignment led me to visit families in the High Prairie area, and one of them asked me if I was related to the Buchanan family that owned the Buchanan Lumber sawmill I admitted it was possible, but probably not. Then I was told that they were from Manitoba. I responded, "My dad was born in Manitoba, so maybe we are related!" Out of curiosity, I visited Gordon Buchanan's home. I was greeted at the door by a nice lady and I explained that I was interested in finding out if we were related. She turned around and said "Gordon, get your Buchanan Family Tree book." That certainly got my attention. I had not heard that there was a "Buchanan Family Tree book"! Gordon was able to show me his information in the yellow 8.5' x 14" book, and I was able to show him my information. We were officially related. Gordon is now dead but for years he was involved in the Edmonton Oilers Owners Group and other community projects. I noted that the book was compiled by Lorne and Doris Buchanan of Neepawa. When I got home I tried to buy a copy of the book. But I discovered that Lorne had retired from the Neepawa.post office and moved away. No one seemed to know how to get in touch with him. Then one day a package arrived in the mail. It was from Annie Brae Buchanan McMane. She explained that she heard that I was looking for a copy of the book, and she didn't need hers as she now lived with her daughter, who had a copy. I added some missing information and made 10 photocopies, sending one of them to dear old Annie Brae. In the 1990s I was assistant director of an LDS Family History Center and I decided to put the contents of the Buchanan Family Tree book into a computer database. Then I sent an electronic copy to the LDS familysearch.org website. I used my Personal Ancestral File software.to generate an electronic copy of the book, which I updated a few times. You can download a copy of the book from my website, if you like. There is a variety of family stories there as well. More recently I have uploaded family photos and stories to familysearch.org, but you will need a free account to view them or download them. I enjoy bagpipe music. I don't have a kilt, but I have a "Buchanan ancient tartan" necktie that I have worn with pride. I first met Marge and Kay in 1967 when I was dating Marge's sister Judy, and I got to know them well over the next few years. Kay had a strong interest in intellectual things, Marge was warm and gracious, a “lady” in all the best senses of the word. They were very attractive people. Sometimes we babysat for them. They had a nice new house on the north edge of Calgary. The house had a large family room in the basement with many souvenirs from Kay's mission in South Africa. The story of their engagement ring is a classic. While serving in South Africa, where diamonds were relatively inexpensive, he bought a diamond engagement ring for his girlfriend back home. After returning home, he proposed to her and offered her the diamond ring. To his dismay she turned him down. A very disappointed Kay gave the ring to his mother saying “You may as well keep it. I am not going to be needing it.” This was very concerning for his mother, since Kay was an only child and his mother hoped to be a grandmother some day. Then Kay met Marge, who had recently come to Calgary to take a business course and was staying in the same building as Kay. Somehow, they seemed to keep seeing each other more and more frequently, and any time Marge was planning on going home to Raymond for the weekend, Kay “just happened” to be planning to go home to Cardston and offered her a ride. After dating for a while, Kay asked his mother “You wouldn't happen to still have that old diamond ring I gave you, would you?” Joyfully, she gave him the ring, and soon Marge was wearing it. Kay was a mentor to me in some ways. I followed his example in becoming a school teacher. And I remember consciously following his advice in buying life insurance, and there were undoubtedly other things I did unconsciously. After his retirement he wrote a history of the community of Woolford, and after my retirement I wrote some short histories but nothing on that scale. I remember us watching the Apollo 11 moon landing with them on the TV in their living room. We saw them frequently until I graduated from University of Calgary in 1970 and we moved away. They enjoyed boating and they had a cabin on Shuswap Lake that was absolutely loved by their children. This cabin was bigger than their house in Calgary and was only accessible by boat. Kay had an interest in mechanical things, and I remember him showing us their little electrical power plant powered by a pelton wheel connected to a mountain stream. Very ingenuous! When Kay's parents retired, he was given the opportunity to take over the family farm. He was not sure that the income from the farm would be sufficient, so he asked his friend Grant Matkin for a job teaching school. Grant's answer was basically. “Kay I would love to hire you, but as Superintendent of Schools, I can't do it. You are a school administrator with a Master's degree, and at the very top of the salary grid. I could hire two newly-graduated teachers for the salary I would have to pay you. I am sorry, but I can't do that.” So Kay stayed in Calgary until his retirement. After retiring, Kay and Marge moved to Cardston, where they had many friends. They had a motorcycle club called the Myth Boys, and they took long road trips together, Kay had a shiny Harley Davidson with all of the bells and whistles. Later they moved to southern Utah, where Marge died of cancer. After some time, Kay married Kathy Bills, and they have been spending their summers in Cardston and their winters in southern Utah. God be with you 'til we meet again my friend. On Tuesday I had an email from a much younger cousin. He suggested that I call him to talk about family history. I spent probably an hour on the phone telling him about his great-great grandmother. Elizabeth "Jane" Hatherley was born in Ontario, in 1871 and married James Alfred Ing on 11 Jun 1902 in Rainy River county, Ontario, Canada. She loved to sing and play the autoharp, and passed that love of music to their children. George. Millicent, and Hetty. But what I remember most about her was that she was completely blind. My grandmother told me about the first time she met Jane. Grandma was newly-arrived in Canada, and had married Grandpa Ing on the day of her arrival from England. One of the first things on the to-do list was to visit James and Jane and their family. When they arrived, Jane had her face down in the middle of a row of vegetables. Grandma, Louisa asked "'What on earth is Jane doing?" "She is weeding her garden. Her eyesight is very poor so she needs to put her face into the plants to see which ones are weeds." Her sight became progressively worse. When I knew her about 40 years later, she was completely blind. Mom would warn us before visiting Uncle Jim and Aunt Jane, to not move our chairs. She had her home thoroughly memorized and she knew where each item of furniture belonged. If we moved a chair out of place she might trip over it and be hurt. Their home was a small house with a wood stove for heat and cooking, a wash stand, and an outhouse. She did all of her household chores, except for putting the bread in the oven and removing the bread from the oven. Someone asked her how she knew when the laundry was clean . Remember that her "washing machine" consisted of a scrub board, and it had no timer. Her reply to the question was "It is clean when it smells clean." When Uncle Jim removed the bread from the oven, she could even check whether the bread was done by knocking on the crust to listen for the sound. When they still lived on the farm, they attended Sunday School at the Norbuck School. One day Jane put on her newest dress, and went to Sunday School, where she sang and played her autoharp. After returning home, she discovered that her dress was inside out. No one wanted to embarrass her by pointing it out. She was a kind and loving lady. Various people said she was the most angelic person they knew, and they never heard a word of criticism by her or about her. The cause of her blindness was probably cataracts. These days, this could be quickly corrected, but not in her day. Earlier this week, by brother Lloyd came with a surprise birthday present, a Garmin Drive 60 GPS unit for my car. I have sometimes thought of getting one, and I had played with using Google Maps on my phone in the car, but found nothing that worked really well. 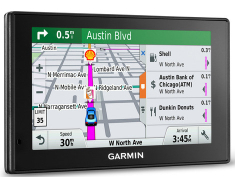 This unit comes with free map updates, and many features, including speed camera warnings, speed limit advisories, lane advisories, and other useful things. I am looking forward to learning to use it. Lloyd helped me to set it up. I was surprised that downloading the maps took 2 hours and 20 minutes. But now it is ready to roll. I tried it out over the past two days, and there is a bit of a learning curve, as with any new technology. It runs entirely on the stored maps and GPS so there is no need for an internet connection, which means that the operating cost should be zero. Thank you Lloyd!!!. What a wonderful gift! This past few weeks have been interesting, and busy. I have been serving my usual 25 hours per week helping in FamilySearch Support. Recently, I was contacted by Rose and Alice, former neighbors and friends from my elementary school days. They wanted help tracing their ancestors Beatrice and Bertie. Their grandfather and grandmother came to Canada from England in 1906, shortly after their marriage. We knew their names and approximate ages. The information on the grandmother Beatrice, was easiest to find. And in the 1911 Canada Census, we discovered that her parents and siblings had also come to Canada. I made good progress in tracing her ancestry. There were lots of primary and secondary census to document my discoveries. But one of the discoveries brought me to a halt. Beatrice died in 1922. And Rose and Alice's mother was born in 1925. Beatrice was Bertie's first wife but she was not their grandmother! A shower of sources presented themselves: censuses, General Register Office indexes and vital records, parish registers. Thank you FamilySearch, Ancestry.com, MyHeritage, and findmy past! I was able to trace Bertie's ancestry for 4 generations, until I found an ancestor who was married in Cheshunt but came from somewhere else. What about the biological grandmother, Bertie's second wife? We found her name and her marriage to Bertie in 1924, and were able to trace her family lines back for 4 generations as well. For these Irish Catholics living in Quebec, the Druoin Collection was marvelous. Rose's father was born in Poland but I could find no record of him there. I found him on a passenger manifest coming to Canada, found his marriage, and found his grave. Fortunately, the family had information on his parentage. The other person for whom I did research had discovered families with his English surname living in Uruguay and nearby counties in South America. They claimed to be all one big extended family. This was somewhat of an adventure, as I had never done research in South America. After researching extensively in England, I was disappointed at how spotty the records were in Uruguay. Sometimes I would find a record and had no way of verifying which branch of the family they belonged to. The use of double surnames was a big help. I assembled what I could find, in FamilySearch, and sent it to my friend to share with the people in South America. Maybe they can fill in the gaps for me. Earlier in the year, my friends Bob and Sandra returned from their trip to Scotland with some special gifts for me from the Buchanan Castle Golf Club shop. I was very grateful for their love and thoughtfulness. Today I had another surprise. As I was talking to friends in the hallway at church, Bob came up to me with a big smile and a gift ... a Buchanan tartan neck tie! I have often thought that a Buchanan tartan tie would be a great addition to my collection of neck ties, but I had never had a good opportunity to buy one. And I have no lack of ties, considering that I have some ties that I have worn for 50 years.. But this one is special. It is brand new, and made in Scotland, and in the "rainbow tartan" of Clan Buchanan. What genealogist of Scottish descent would not love to have such a treasure? Thank you Bob and Sandra. May Christmas be a special and blessed time for you and your family! And this is my wish to each of you as well.